In all the organizing and cleaning of the house, the garage is often forgotten. But especially if the garage is also used as storage, there is always need to for keeping it practical and useful. Here are a few tips on how to do that. If you’re looking for helpful garage organization tips, here are some great ones to get started with this New Year. The first step is to find out how much space you really have for storing. Do to that, make an layout of your garage and determine on the space that is available. A good trick is to park your car in it as you normally do, and open all your car’s doors. No make an outline of your car with opened doors, using tape or chalk. Leave some extra space when you make the outline. Close the doors and remove your car. Now you will know exactly how much space you have to use as storage. 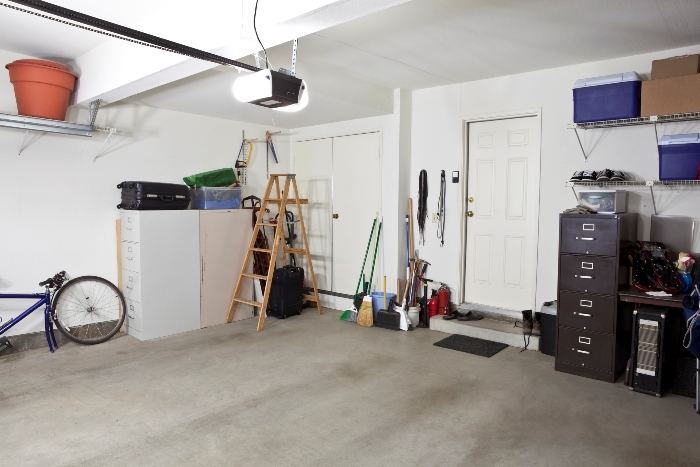 Knowing how much space you have, try to decide which things need to be in the garage. Doing that, you will automatically make decisions about what to keep in your house. Try to keep only the truly necessary stuff and decide what you will sell, donate or toss. Divide your stuff into categories. Choose for each category an area where you will be storing it. This way you will always know where to look when you want to clean your car or to find seasonal items. Remember to keep stuff you need often in an area that you can reach easy. Items that come out only one or two times a year, like Christmas decorations, you can keep in a more remote or higher place. Also, don’t forget that large, heavy items should be stored at the bottom. Shelving is the best friend for anyone that wants to store stuff. You can choose between open shelving, closets or combine these two. You can re-use old cupboards or shelves. Get some bins, boxes and buckets to put your smaller stuff in them. You can either categorize by use or by items. So you can store all your rags at one place, or put the rags used for car cleaning with your other car cleaning materials. Labeling all your storing items is essential to find your stuff but to also knowing in a second where something belongs to. Walls can be made available for a great amount of storage. Use pegboards, hooks and wire racks to store everything, from bicycles and shovels to tools and pots. There are great options available to use the higher parts of your garage for storing. If you need that space, it is worth having a look at those options. Also, hooks to hang your bicycles or other items are a great option. Need more garage organization ideas? Check out these 19 ideas. Organizing your garage has not to be something difficult to do. If you plan it correctly and use the available space smartly, you will be suprised with how simple it can be done. Let us know what Garage Organization: Tips to Start off the New Year you have! For more organization tips on Stagetecture, click here.